Precious grease based on lanolin and vegetable oils to nourish, soften, protect and waterproof shoes, boots and boots, boots, harnesses and smooth matte leather goods, leather and oiled leather. Notes: Formula rich and precious, completely free of dyes. Thanks to the ingredients contained in it, turns out to be a real cosmetic for footwear. returns to the initial color. Respect the environment Lanolin is obtained from the fleece of the sheep without causing the animal any harm or discomfort. Clean the surface with a cloth to remove any dust or dirt present. Take the right amount of grease with a brush and treat uniformly the entire surface. Let stand a few minutes until the lanolin and precious oils, including Almond Oil, are well absorbed. Wipe with a dry brush or cloth to remove any residue. Shoes and kind cowboy boots, Texans, shoes and sneakers in leather and matte leather, soccer shoes or boat, hiking shoes and sports in general, saddles and harnesses for riding. 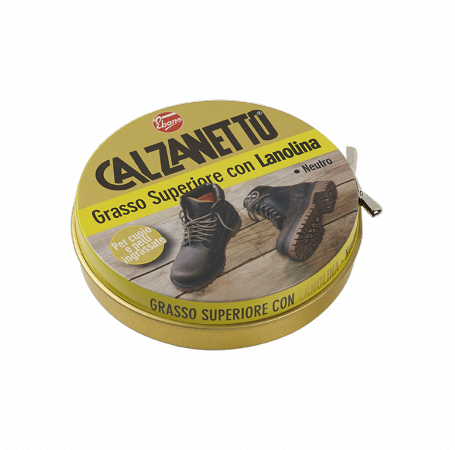 The cosmetic Vaseline, the almond oil and the lanolin contained in this precious grease nourish, soften and protect footwear, boots, harnesses and objects made of leather and open-grain leather, contribute to the enhancement of the appearance right from the first application and protect from water and atmospheric agents.